With voice searches projected to dominate about 50% of all online searches by 2020, it's essential for healthcare providers to adapt to the changes and advance their practice. Recent studies have suggested that voice searches conducted by patients are seeing consistent growth. According to a BrightLocal study, more than about one-third of healthcare consumers use voice search for circumstances like scheduling an appointment or speaking to a healthcare professional. Another survey by Yext suggests that 53% of patients would be interested in booking an appointment via a voice device if it were available today. However, that future is already here! At this year's Google I/O conference, CEO Sundar Pichai unveiled a brand-new voice assistant technology, Google Duplex, which promises to add more functionality to the currently transactional use of voice search. What this means is that very soon patients won't just be scheduling appointments via smart voice devices, but they would also be managing their health by requesting reminders to take prescriptions, and also hear answers to quick questions like what kind of insurance a doctor accepts, what is the working hours of the nearest healthcare practice, etc. How does all of this work and how can healthcare practices can gain leverage from integrating voice search in their healthcare marketing campaign? Keep reading to learn more. Voice searches mostly consist of question phrases, so the optimization of user intent is required. Since patients use voice search for informational queries more than discovery queries, their intent happens to be more about clearing the small doubts before finally selecting a provider. Those small doubts could be related to issues like wheelchair accessible entrances, review ratings from other patients, and even about scheduling an appointment online. In other words, if your practice is optimized on Google to respond (as a front-runner) to those smallest queries, then undoubtedly, you'll have an edge over your competitors on Google. 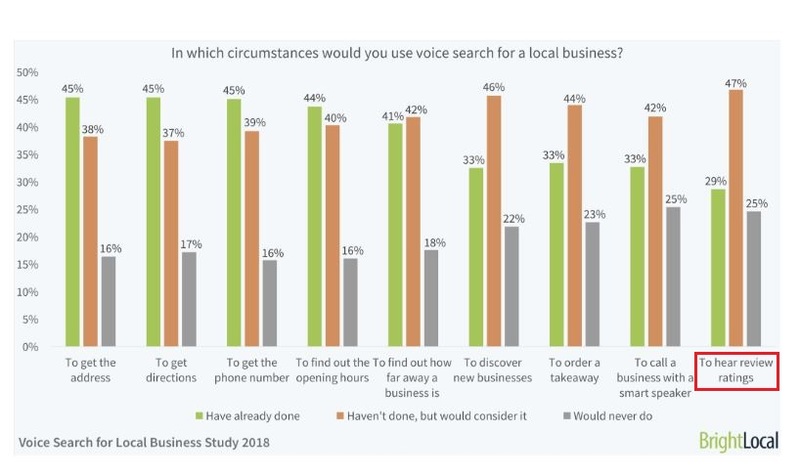 The image below shows different intentions with which users conduct voice searches for a local business, including healthcare. 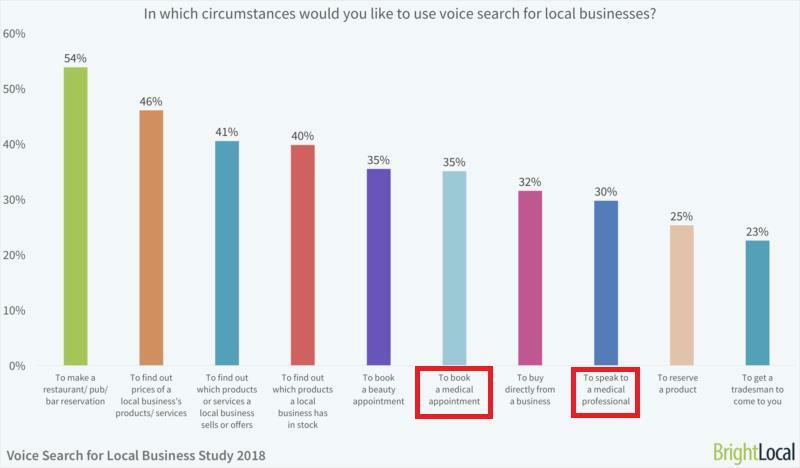 Reputation Alert: As you can see (under the red box in the attachment above), hearing reviews is one of the top things people would consider using a voice search for, so the trend of people using it will continue to increase. It's a warning sign that you need to look into optimizing your online presence and reputation outside your health system's website, including the review platforms such as on Google+, Yelp, HealthGrades, etc. With the above in mind, here is a breakdown of what healthcare practices and their search engine optimization (SEO) team can do to take advantage of the voice search revolution. Make a list of the topics that are relevant to your business. List as much as you can think of! Discover popular questions that users ask around these topics. For that, you can use online tools like AnswerThePublic to make the task easy. Google each of these questions. Note the questions not found in a featured snippet. Create content for the keywords that were not found in the featured snippet. As patients normally use voice search for quick information, such as getting the address, phone numbers or directions, hearing reviews, or making a call to the clinic, it's essential for your healthcare practice to improve its standing in the local search pack. That's because it's the local search pack that Google voice assistant reads from when patients ask for a locally available healthcare practice. 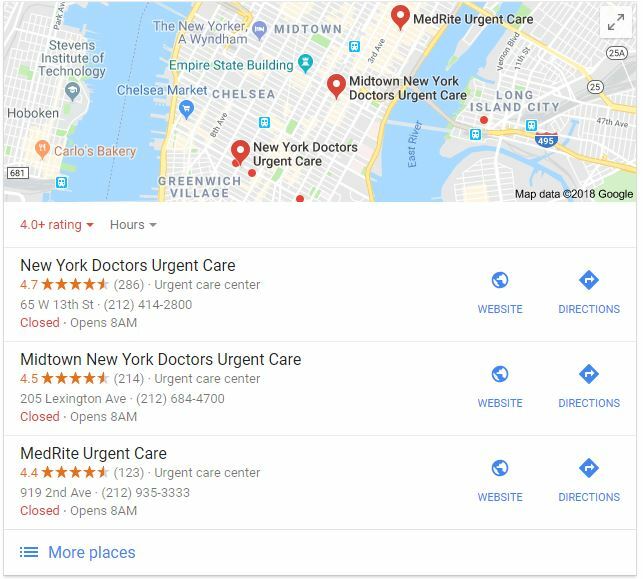 For example, if a patient residing in New York asks for “best urgent care clinic near me” from Google Voice, here's how the local search pack would appear. (see the image below) As you can see in the attachment above, local search pack contains all the information about a business which makes it easy for Google voice assistant to read the relevant answer in the most efficient way to your patients. To help your practice appear in the local search pack, you'll need to do two things: First, complete your Google My Business listing to help Google learn about your practice. Second, ensure that people are talking about your practice in a positive way. This is where online reputation management and online reviews come into the picture. Google is among the few sites that encourage businesses to proactively ask customers to leave reviews. This means utilizing online reputation management tools to solicit positive reviews from your patients will help in improving your standing in the local search pack. Frequent reviews and a positive aggregate review score on Google (as reviews appearing into the local search pack are fetched from Google+) will improve your chances of getting into the local search pack and featured in voice search results. We don't completely know how things are going to turn out with Google Duplex active in the voice search system. However, what we do know is that Google Duplex is going to change how patient-provider interactions occur from now on. With Google Duplex, the way your patients book appointments will be transformed. Soon your front desk staff will be fielding calls from Google voice assistants. Your healthcare practice should be prepared for the change and adapt promptly. Varying circumstances during those voice calls may lead to lost patient acquisition opportunities. 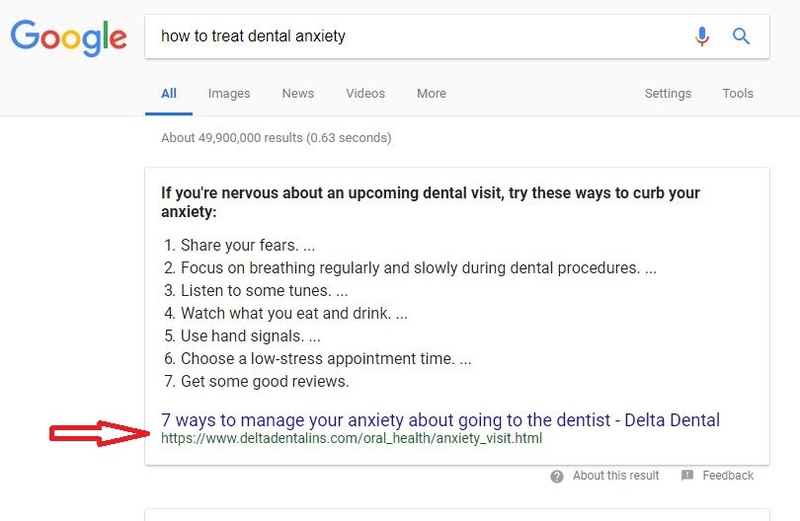 The best way to ensure success is regular testing with Google Duplex. Tell your staff to practice on it from now. Tell them to ask their voice assistants to schedule an appointment with your practice, then as the Google voice calls your clinic, talk with it and try to understand the subtleties. Testing again and again will help in adapting to the technology and establish your practice ahead of your competitors!